↳The advanced Kenwood TM-V71A dual bander provides sophisticated, high-powered performance on 2 meters and 440 MHz. Power levels are 5/10/50 watts on both bands. The large radio display clearly conveys the status of the radio and can be set to green or amber. The radio's controls are very logical and feature separate volume/squelch for bands A and B. This transceiver allows you to change the orientation of the front panel. Depending on where/how you installed the transceiver you may wish to flip the front panel upside-down for easier operation. 1000 Memories can be alpha tagged up to six characters. Other features include: scanning, weather alert, password, dual receive on same band and cross-band operation. This dual bander has ten dedicated EchoLink® memory channels as well EchoLink sysop-mode operation. The rear panel has dual audio outputs and an SO-239 [UHF type] antenna jack (USA version). 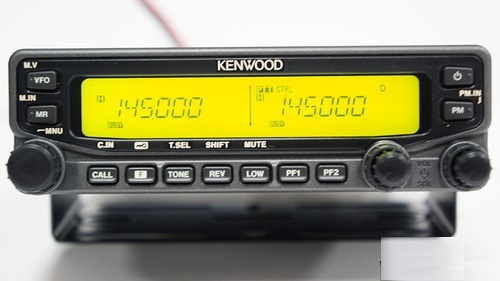 ↱ The Kenwood TM-V71A comes with: MC-59 hand mic (with Up-Down and DTMF), DC power cable, fuse, front panel mounting bracket, main unit mounting bracket, microphone hanger and English/Spanish.